Patra's Other Place: Happy Easter to everyone visiting my blog! New hope for Ken's heart. A new look to eggs. I'm not alone in cyberspace! Happy Easter to everyone visiting my blog! 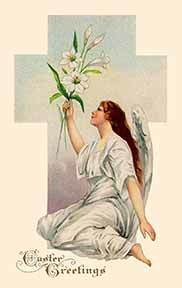 I found this lovely vintage picture on this site Vintage Images of Easter. There are many beautiful pictures available here, some of them free, including this one. The site also has interesting facts about Easter, and I have taken the liberty of reprinting some of them here, but you can see the originals by clicking the above link. My own feelings about Easter have changed in recent years. Although I was brought up in a C of E household, and still believe what I was taught to a large extent, I feel that Easter now has reverted to the original pre-Christian era pagan festival. Nowhere in retail outlets is there any sign of the religious 'reason for the season' - it is all chocolate eggs, bunnies, and other animals. It would be nice if the chocolate manufacturers made images in the form of a cross or other religious icon instead of eggs etc., don't you think? Easter is the Sunday that celebrates the resurrection of Christ, and is one of the most holy days in the calendar of Christian churches. The Easter message is one of hope and victory over death, for it recalls that Christ rose from the dead on the third day after his crucifixion. Easter symbolizes the love of God and the promise that man's soul is immortal. In many languages, the name for Easter comes from the Hebrew word "pesah", or passover; in fact, Easter was first associated with the Hebrew festival of the Passover, which falls in the spring. Easter was celebrated at different times by the early Christian churches until 325 A.D., when the Council of Nicaea fixed the day as the first Sunday after the first full moon after March 21. This always places Easter sometime between March 22 and April 25. It is believed that the council probably set the date of Easter to fall near the time of a full moon so that pilgrims journeying to worship a shrine might have moonlight to help them find their way. Good point Sharon - I hadn't thought about the aspect of offending anyone. What is the world coming to? We are supposed to be a free country - freedom of religion is included surely! The Christians aren't the ones who take offence..